The rapier loom is the most commonly used as shuttle-less weaving machinery. 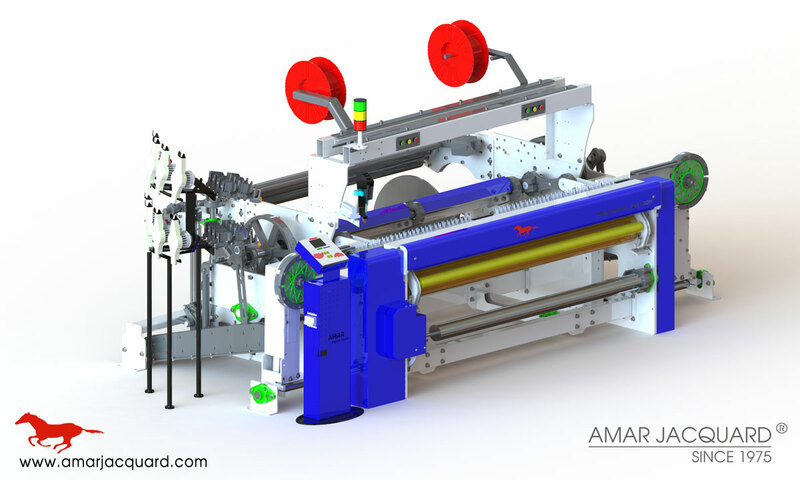 Amar Jacquard Rapier Loom features include fast weaving speed, high level of automation, and maximum efficiency & long working life. Our high speed rapier looms also allow, the unique weft color choosing system, maximum 16 colors of filing picks to be woven. We offer all these advantages available at a low price, the rapier loom has seed wide use in weaving dyed yarn, towel, silk weave, wool fabric, and bast fabric. We have added some new special features for making error less fabric i.e. we offer auto pic finding option (no need for matching pic by weaver, while breaking of weft yarn), operator can also use the feature of electronic creaming and density (auto pic variations) motion by putting command in jacquard and dobby design. At Amar Jacquard, Fully Computerised High Speed Rapier Loom, we are specialized manufacturers from India are available in sizes 360cms, 325cms, 300cms, 275cms, 255cms, 225cms, 205cms, 180cms, 150cms and more. We provide full and perfect after-sales service, R & D, technical support and spare parts. We also manufacture and export Rapier looms with high speed Electronic Jacquard Machines to worldwide countries.